In District Court yesterday, state Sen. Ron Menor, center, appeared for his arraignment and plea to operating a vehicle while under the influence of an intoxicant. 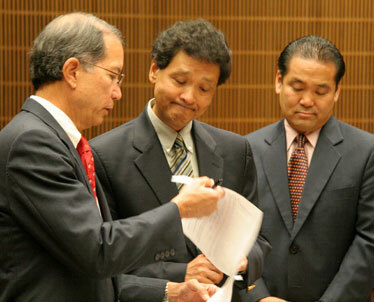 He was with lawyers Howard Luke, left, and David Hayakawa. Sen. Ron Menor probably will not face a reprimand from the state Senate after pleading no contest in Honolulu District Court yesterday to operating a vehicle under the influence of an intoxicant last month, said Senate President Colleen Hanabusa. "This is close to election, and I believe that the real people who should stand as judge and jury should be his constituents," Hanabusa said. Menor started serving a sentence of two days in jail yesterday. Menor is the second lawmaker in a year to be arrested for drunken driving. State Rep. Jon Riki Karamatsu stepped down as vice speaker of the House after his DUI arrest last October. The state Senate probably will not discipline convicted drunken-driving offender Sen. Ron Menor, said Senate President Colleen Hanabusa. Hanabusa said she does not expect any official reprimand of Menor because it is an election year. Menor's term expires this year. "I think if it was in the interim, it's a different story because the community doesn't have any way to have input," Hanabusa said. "This is close to election, and I believe that the real people who should stand as judge and jury should be his constituents." Menor went to jail yesterday and will stay until tomorrow, after he pleaded no contest in Honolulu District Court to operating a vehicle under the influence of an intoxicant last month. "I do believe each and every one of them feels remorseful," Hanabusa said. "For both situations they will have to answer primarily to the people who have their political futures in their hands." Menor apologized to his family, colleagues and constituents for his actions yesterday before he was taken into custody. "I have always supported the need for strict DUI laws, and I fully accept my sentence, which I will serve immediately," Menor (D, Mililani-Waipio) said. "I have learned much from this experience and will never let it happen again." Judge Fa'auuga To'oto'o fined Menor $800 and sentenced him to 48 hours in the Oahu Community Correctional Center because he was driving drunk with a minor under the age of 15 in the vehicle. He also lost his license for 90 days, and will spend 14 hours in an alcohol treatment class. "It's a convergence of factors that led to his arrest," his defense attorney, Howard Luke, said. "He thought it would be more consistent with his contrition in his acceptance of responsibility to go in immediately." Menor was arrested at about 12:30 a.m. April 27 near the Lunalilo onramp of the H-1 freeway. Police saw Menor's vehicle "weaving in a snakelike motion" as traffic began to build up behind it. His two sons, ages 11 and 17, were in the vehicle with him. When pulled over, police said Menor smelled of alcohol and was swaying back and forth. Prosecutors said yesterday that Menor did take an initial field sobriety test, which recorded his blood-alcohol level at 0.147 percent, well above the legal limit of 0.08 percent. A police report on the arrest stated that Menor did not take a preliminary alcohol screening test. Menor told arresting officers that a missing contact lens was the reason for his slow driving. He and his two sons had attended the Chicago rock concert at the Blaisdell Center, then went to a Japanese restaurant. He has said he had "one or two small glasses of wine" before driving. When Menor was being processed for his arrest, he declined to take a further chemical test for his blood-alcohol content level. He faces losing his driver's license for up to a year for that refusal. Luke said the senator is requesting a hearing with the state Administrative Driver's License Revocation Office to contest the one-year revocation. Luke said in preparing for the case, he obtained receipts from the restaurant that listed two glasses of wine. He also had notes from his doctors regarding Menor's injured left foot and missing contact lens. "There were things that could be challenged in court," Luke said. "But there are other factors, and they're in the police report, that obviously made it a very difficult case, and it's something he believed he should take responsibility for." Renee Sonobe Hong of the city Prosecutor's Office used yesterday's sentencing as a reminder to the public to drive safely. "Regardless of a person's position, regardless of the contact lens or the fractured foot, we all need to responsible," Hong said. "It's the start of the Memorial Day weekend, summer and the graduation season, and we would just like to send the message out. Please don't drink and drive."